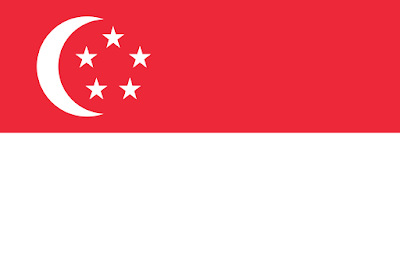 So, Singapore is somewhat of an unusual country- and that's not just because of their somewhat harsh justice system that lead them to cane tourists who vandalize and wreck up the place. The place was founded in 1819 as a trading post for the British East India Company by the excellently named Sir Stamford Raffles. Gaining independence in 1963, they initially joined up with Malaysia- but here's the kicker- they were expelled from Malaysia two years later. Per Wikipedia, there was 'distrust and ideological differences' between the People's Action Party and United Malays National Organization. Whatever the reason, Malaysia told Singapore to GTFO and they did, declaring independence on August 9, 1965. The red (upper) half, stands for universal brotherhood and the equality of man. The white (lower) half for pervading and everlasting purity and virtue. The crescent moon and the five white stars form a circle- the five stars are for the ideals of democracy, peace, progress, justice and equality. And that's the flag of Singapore! Remember, until next time keep your flags flying- FREAK or otherwise!